In 1946, he caught pneumonia and pleurisy and spent most of the rest of his life in his sickbed. He eventually lost the use of both his right lung and his right eye.
. Hino Soojoo 日野草城 Hino Sojo . We know from a review of early Japanese literature that the term ‘eyeglasses’ was first noted around the year 1551. Francisco St. Xavier (1506-1552), a member of the Society of Jesus founded in Spain, visited Japan in 1549 as a missionary with the goal of converting people to Christianity. He was unable to meet the most powerful lords of Japan, the Emperor and the Shogun, because of a civil war. Instead he visited Yoshitaka Ohuchi, an influential local feudal lord. He was granted an audience and brought many gifts, including vision aids (eyeglasses). Therefore it is considered that vision aids first appeared in Japan at that time, possibly the ones presented by St. Xavier to Ohuchi. This story has several sources and is considered highly reliable as a historical fact. Other Jesuits who later followed Xavier also brought similar gifts in order to obtain permission to continue their missionary activities. In addition to this, the Daisenin Temple (Kyoto) houses another old pair of nasal-hinged (pivoted - riveted) eyeglasses. According to Temple tradition, which is questionable because there are no supporting records, this pair was used by the eighth Shogun, Yoshimasa Ashikaga (1436-1490) and were then handed down to the twelfth Shogun, Yoshiharu Ashikaga (1511-1550). He subsequently gave these glasses to the founder of this Temple. It should not be discussed easily, but, in a calculation,Quite possibly these are the oldest vision aids in the world with known provenance (unless something earlier exists at the Vatican Museum). 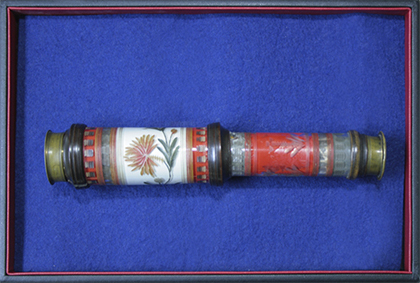 The eyeglasses and case are decorative, beautiful, and made of hand-carved white ivory. This type of spectacles was used towards the end of the 15th century in Europe, as noted in Poulet’s 1978 Atlas. Two other early pair of spectacles are conserved in the Memorial Museum for Shogun Ieyasu Tokugawa (1542-1616), founder of the Tokugawa Shogunate. They are made of yellow tortoiseshell and have a rigid bridge. 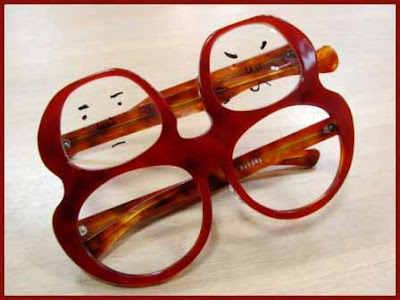 It is said, however, that nobody knows for certain how these eyeglasses arrived at the Museum. They are of a style used in Europe at the end of the 15th century. One story says that these glasses were brought in 1611 by Sebastian Viscaino to express the gratitude of the Viceroy of Mexico for the help that Ieyasu had extended to some shipwrecked Mexicans. Katsumoto Onishi, M.D., Japanese scholar and pioneer of spectacles-research, studied the first type of spectacles in Japan. His observations were serially written in the Japanese Journal of Ophthalmology in 1919. Dr. Onishi earned great respect as a highly regarded leader of the Japanese Ophthalmological Society in the early 1900’s. At first he expressed that the first introduction of spectacles into Japan was 1529, but 4 years later, he corrected this date to 1551. Sekiya Shirayama has also confirmed the authentic material which shows the date to be 1551. The literature regarding the early history of spectacle manufacturing in Japan has been explored and an important conclusion can now be drawn about the major role and influence that Japan played in the development of spectacles in the Far East. Spectacles are called megane in Japanese and this word apparently originated in the middle of the 17th century. Along with the earlier word aitai, these were both listed in the important encyclopedia published in 1712-13. Nishikawa Joken ( 1648-1724) wrote the book "Nagasaka Yawa-gusa : Night stories of Nagasaki". He stated that Hamada Yahei, a merchant from Nagasaki, was the first to start manufacturing spectacles in Japan. Yahei was an active trader in the 1620s and he traveled to Taiwan to become involved with the struggle with the Dutch people. It is said that he taught Ikushima Tokichi, who actually made the spectacles, but the details of this are unknown. On the other hand, spectacles were also manufactured in Kyoto in the middle of the17th Century. Matsue Shigeyori (1602-1680) wrote "Kebukigua" in 1645 in which he listed gem-art as working with spectacles, Rosary stones, and pearls. There were many manufacturers in Kyoto, beginning from ancient times, and they made ornaments using amber, quartz, corals, and pearls. These were known as crystal works (Tama-Zaiku). With these traditional techniques, people started to polish glass for spectacles. The best lens was made of quartz, this glass had originated in China, and both sides of the lenses were polished. Glass production in Japan began around 1620 and as production increased, it slowly replaced natural quartz. 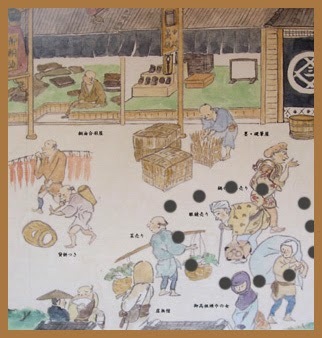 In the book "Kyo-Suzume" (spallows of Kyoto) written in 1665, there is a picture which shows spectacle shops. Also, in the book "Yoshu-Fushi" there is a description of how to lenses are polished. Subsequently, many books were published describing lead polishing. However, there was no book showing the frame, until 1732 when a book "Mankin-Sangyo-Bukuro (Collection of Miscellaneous Products) described the spectacle frames: the green frame by Ivory, hair of Wales (actually this was the hair-teeth of whales, cormorant bone, brass, etc). There is no doubt that spectacle frames were also made of brass before 1730. On the other hand, in Europe, cheaper spectacles used wire frames while more expensive spectacles used metal frames made from materials such as brass. In England, it was understood that the monocle (the quizzing glass for myopic use) with a brass frame was popular. The production of brass had been known in China before Christ, and brass products were also imported into Japan and they have examples of such brass products preserved at Shosoin Treasure House. In both the Roman Empire and in China, coins were minted out of brass and therefore that material was in popular use in the 17th Century in Japan. In the latter half of the 17th Century, a book "Edo-Kanoko" (Miscellaneous Pictures of Edo) was published in 1687. In it there are separate descriptions of both the gem-artists and the glass polishers. 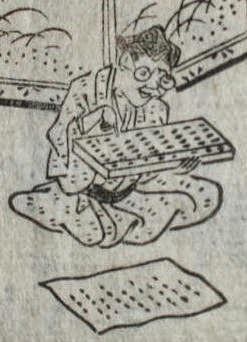 In addition, "Yoshu-Fushi" published in 1684 describes Japanese eyeglasses as being superior to the imported ones. Therefore, it is probable that the Japanese spectacles of that time reached a high standard compared to those made in other countries. During this 17th century, the Japanese excelled in string spectacles, added the midline nasal projection bridge, and reserved the largest spectacles for the nobility. Another new trade began to appear in the late 17th century, known as Japanning. This arrived in Paris, then London, and soon spread to Holland and Germany. This was a newly learned Varnishing (Lacquering) process from the Far East that was very much in demand. 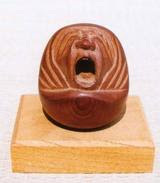 Optical cases made with Japanning were often considered works of art. The process was kept a virtual secret until the mid 18th century. hanamegane 鼻眼鏡 Glasses "on the nose"
temochigata megane 手持ち型眼鏡 Glasses "to hold in the hand"
. Repairmen　and Business in Edo 江戸の修理屋 . One of the first pair of glasses in Japan in the possession of Tokugawa Ieyasu, now preserved at Kunozan 久能山東照宮. 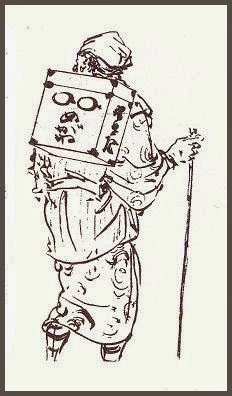 The vendors and repairmen of glasses were quite a news in the beginning of Edo, later people got more used to them. They carried their merchandise in a wooden box with glasses painted on them. There were still many people who could not read or write in the beginning of the Edo period. Issa's tone is wryly ironic. He (or someone) has paid three pennies (three mon) to peer through a telescope to see ... only mist. On one level, he groans at the waste of money to have paid to see, magnified, nothing--the same nothing that the naked eye views for free. On another level-- and there's always another level in Issa's best haiku-- he smiles at human enterprise and its futility. According to Makoto Ueda, this haiku refers to a scenic lookout on Yushima Hill in Edo (today's Tokyo); Dew on the Grass: The Life and Poetry of Kobayashi Issa(Leiden/Boston: Brill, 2004) 16. The mon was the basic currency of Issa's time. It took the form of a coin with a hole in its middle so that it could be strung on a string. 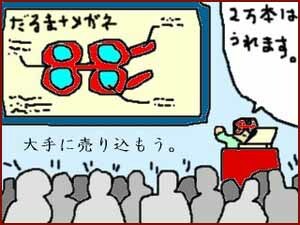 According to Shinji Ogawa, a bowl of noodles in Issa's day sold for 16 mon: the equivalent of approximately four or five U.S. dollars today, which would make one mon = 25 - 27 cents. The three mon telescope view would cost approximately 75 cents today. Kobayashi Issa’s Mist: Haiku or Senryu?